Topics: Quality Cat Furniture, Cat Furniture, Cat Condos, Pet Insurance, Vpi Pet Insurance, and Low Cost Pet Insurance. Theplanet.com Internet Services Inc (Texas, Houston) is the location of the Apache server. 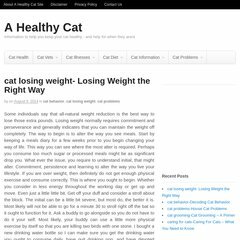 A-healthy-cat.com's server IP number is 174.120.5.158. ns2.hostark.com, and ns1.hostark.com are its DNS Nameservers. PING (174.120.5.158) 56(84) bytes of data.